I’m sure there are tons of apps that allow you to create great shopping lists, but this one is very-very useful and convenient to use. You download the application (available for Windows Phone and Android, not sure about iPhones), create an account online and start creating lists. If you log on to shopglider.com you can create and edit lists on your computer and all the changes you make will be visible on your phone. I keep a tab with shopglider open on my computer all the time so that if I remember anything we need, I can write it down straight away and H can see exactly he has to get when he goes to the store. I can easily write down quantities, give notes and even mark which store H should go to to get a certain item. Another perk is being able to check off things you’ve already bought once you’re at the store – this way it is easy to keep track of which aisle you still need to go to. We currently have two lists up – one is for stuff we need straight away, the other is for what we’re going to buy when we go for our monthly grocery shopping spree and fill all the cupboards (this very conveniently falls on payday, I wonder why :D). Try remembering that you’re out of starch or flour without a nifty little app. 😀 If we had this when we were renovating, I could have created a hardware store list and saved my brain a lot of trouble. See how useful it is? Let me know how you guys shop in your family! Do you use smartphone applications to make housework and shopping easier? Which ones? Tell me! Maailmas on kindlasti sadu äppe, mis toetavad suurepäraste poenimekirjade koostamist, aga see siin on tõeliselt kasulik ja mugav abiline. Alustuseks tuleb äpp alla laadida (see on olemas Windows Phone’ile ja Androidile, iPhone’ide kohta ei tea), siis kasutaja registreerida ning hakata nimekirju koostama. 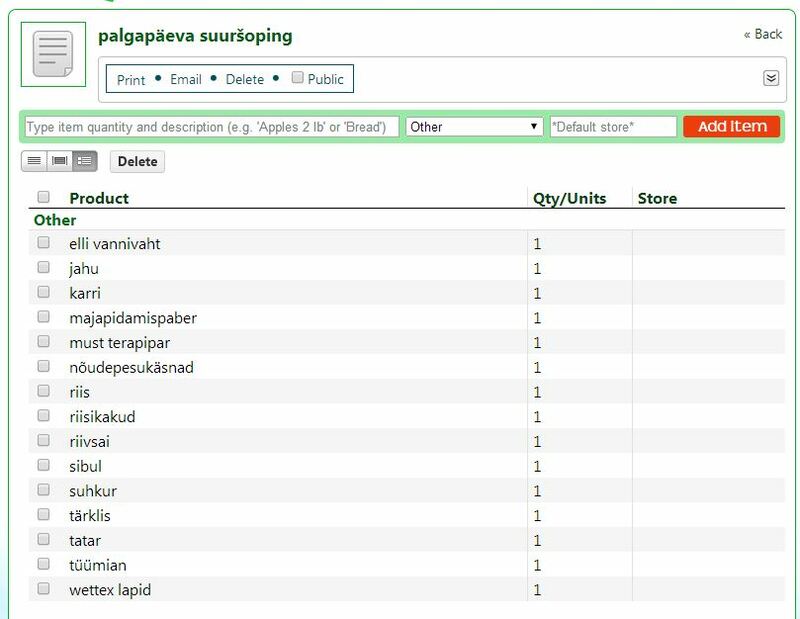 Kui arvutis shopglider.com‘i sisse logida, saad otse arvutist nimekirju koostada ning tehtud muudatused on telefonis reaalajas näha. Minul on Shopglider ühel brauseri vahelehel koguaeg lahti ja kohe, kui mul miski vajalik meelde tuleb, panen selle ruttu kirja ja H näeb poodi minnes kohe, mida ma sinna kirja pannud olen. Nimekirja saab hõlpsasti lisada kogused, märkmed ja isegi poe, kust seda konkreetset asja osta tuleks. Suur boonus on juba korvi pistetud asjade mahakriipsutamise funktsioon – nii on lihtne järge pidada, mis juba ostetud ja mis veel poest üles leida tuleb. Kuidas teie peres poodlemine välja näeb? Kas kasutate majapidamise ja ostlemise lihtsustamiseks äppe? Milliseid? Jagage! Here’s a list of iPhone apps, for those who don’t use Android. Grocery Gadget seems to be the closest thing to ShopGlider, and it allows you to link multiple accounts.